Richard Harris is Martin Steckert, a prison inmate rejected for parole the umpteenth time, so he ingeniously breaks out. (It is an escape, by the way, narratively prescient of Hannibal Lector’s escape but without the facelift.) On the lam he kidnaps a young boy who is also named Martin – Justin Henry, who played the young son of Dustin Hoffman and Meryl Streep in Kramer vs Kramer (1979). The youngest actor ever to be nominated for an Oscar, now five years older and, working alongside heavyweights like Richard Harris and Karen Black, Henry proves all over again acting is in his DNA. He will survive growing up in the trade, leave the business for an education, and return to work in front and behind the camera. James Coburn is the chief inspector out to capture Martin and is more than willing to bring him in dead. In fact, that’s his preference. The problem is endangering young Martin. 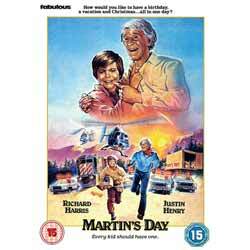 The second problem is young Martin begins to love Harris and adopt him as his stand-in father. Through crazy luck and anarchistic bravura, both Martins elude the police and even make fools of them. A dangerous game to play. But in fact, without the police, big Martin would not be able engineer his continuing evasion. Young Martin’s hunger for a dad makes him the perfect Stockholm Syndrome victim, identifying with his captor. No matter that Martin, quite a sociopath, does some scary things, potentially lethal. Coburn is unsympathetic to this crazy bravura and plans on several occasions to have Martin’s head blown off. The only thing that prevents this from happening is the boy. (A side note: this is a painful chapter in James Coburn’s career. The star was succumbing to debilitating arthritis in his hands. He would never fully recover but kept working, finally winning an Oscar for his performance as Nick Nolte’s father from hell in Affliction (1997). All his work here is a study in instrumental economy, playing through the pain. Funny things happen but one feels a guilty tension in laughing, a tension between anarchism and sanity. Who but Richard Harris could make sociopathic anarchy funny, let alone cajole us into rooting for him? But he brings it off. We are pinned by the unpredictability here. It’s worrying and uncomfortable but simultaneously attractive. Is it all going to end tragically? Tragicomically? Or with capitulation to acceptance? And if the latter, what could drive big Martin to that choice? I won’t spoil it here. I thought I knew but I was wrong. This film suffered a brief funerary release in the USA in early 1985. In the decade after, it was sprinkled across Europe with little or no fanfare. As a Canadian film, it was dead and buried in America, hardly reviewed, ignored without even time for disdain. This was a mistake. The Harris performance is always a joy, always riveting. Harris does good craziness. Like a fox. His chemistry with the young Justin Henry is believable without Hollywood child actor show-offishness. The hero here is director, Alan Gibson who would only live two more years with some UK TV episodes his last work, This, from a screenplay by Alan Scott and Chris Bryant, is his last film. Gibson had an interesting body of work across genres: horror, history, mystery. He directed Ingrid Bergman in her last role in the TV movie A Woman Called Golda (1982) and horror films like Crescendo (1970) and Dracula AD 1972 (1970). But his early rise in UK TV is the stuff of legacy. His participation in the eminent talent base for Play for Today established his standing for a lifetime of ‘keeping busy’. His episode The Flipside of Dominick Hide caused the BBC public relations department to report ‘No other single new BBC play in 1980 attracted so much correspondence.’ He never stopped working. Play for Today was often criticised for its anti-establishment themes so it’s easy to see how Gibson was the director of choice for Martin’s Day. Imagery by Frank Watts, BSC, is clean, efficient and involving; the autumnal beauty of the Canadian countryside an antipode to the psychological pain being borne in every scene. The disc is clean, sharp and sensitive to the hues and details within shadow as well as moist or dusty air. Martin’s Day deserves shelf space in any DVD library.